According to Wikipedia, a popular encyclopedia, Chipmunks are small, striped rodents of the family Sciuridae. All species of chipmunks are found in North America, with the exception of the Siberian chipmunk, which is found primarily in Asia. And, according to Producers of Alvin and the Chipmunks movies, chipmunks look and sound quite different, and of course, in a fantastic and amusing way. In this post, we will show you how to apply the same chipmunks voice effect, as cool as which was used in the Alvin and the Chipmunks movies for your own voice recording, voice over, real time voice chat and pre-recorded audio files. Unlike the other complicated voices demonstrated in my previous articles like Optimus Prime, Darth Vader, Bane, etc., the Chipmunks' voice does not require either special effects or advanced using skills of AV Voice Changer Software. Just work with the Pitch, Timbre and Advanced tune. The post idea shall be divided for real time tasks or online tasks (e.g., ingame voice chat, voice chat over IP and instant messengers) and offline tasks (e.g., pre-recorded audio file morphing, audio editing). For both real time voice and pre-recorded audio files the VAD feature is highly recommended because of its fine compatibility and stability. Settings: move the cursor on the Pitch-Timbre graph (also called the Morpher graph) to change the voice. Increase this parameter will give the voice more vibration. Decrease this parameter to have a closer to natural voice and purer voice. Make some minor changes with the equalizer would enhance the output quality pretty much. Voice Changer Software program has many good voice & audio effects to suit all the voice morphing and voice changing tasks. And these effects do help if you do know how it works. Otherwise, it may go wild and spoil your tasks. So, for the chipmunks voice, we do not recommend using addition voice effects unless you know how to use them or ready to spend hours on playing with them. You may also need to check if there are effects ON after the last uses of the voice changer program. And you should also simply turn them OFF or reset that effect settings. If you are a fan of prank calling, broadcasting or you'd like to entertain changing your voice while ingame, you may now try connecting to your favorite channels and have fun. 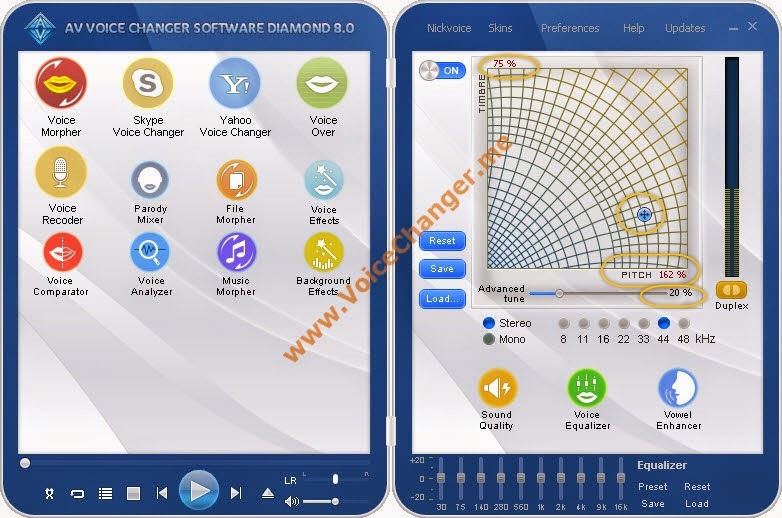 **If you need instruction on using Voice Changer Software with a certain programs, please just let us know by leaving your comment here. We would be happy to be in help. 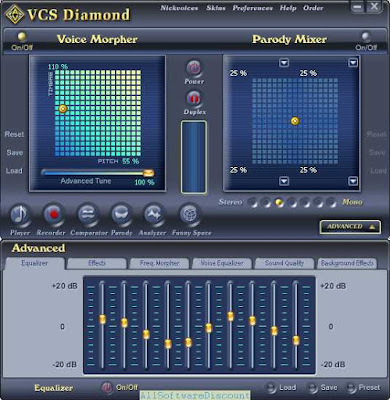 Batch File Morpher is well-known as a great feature of AV Voice Changer Software Diamond for morphing: adding voice effects to multiple pre-recorded audio files at a time and converting them to other audio file format as well. So, feel free to refer to the post Apply Voice Effects To Multiple Pre-recorded Files With Voice Changer Software 8.0 Diamond if you would want to apply the chipmunks' voice effects to your pre-recorded audio files. **The Voice Changer Sofwtare can be used with any other audio editors. If you would like to learn how to do that with a certain audio editor, please feel free to let us know by leaving your comment below.